Lilo Herrmann (shown here with her son Walter) joined the Communist youth organization as a teenager. As a student, she joined the circle around Stuttgart physician and author Friedrich Wolf. Lilo Herrmann publicly protested against Hitler's takeover of the government with friends from her Communist student group, for which she was expelled from the university a short time later. She participated in Communist Party resistance activities and informed her friends abroad about National Socialist armaments efforts. 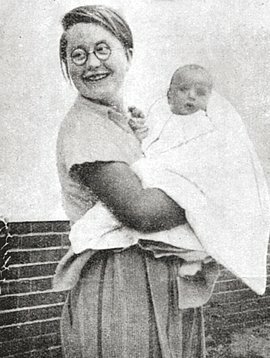 In December 1935 Lilo Herrmann, who now had a two-year-old son, was arrested by the Gestapo. In the summer of 1937, she was sentenced to death for treason together with Stefan Lovasz, Josef Steidle, and Arthur Göritz. The sentence was carried out in Berlin-Plötzensee on June 20, 1938, in spite of worldwide protests.